We apply the latest laser scanning and conventional surveying techniques in order to ensure that the construction is in accordance to the required specifications. By using 3D laser scanning technology, we capture 3D measurements to model the environment, through data which can be modeled, queried or archived. Through our professional surveyors’ experience, the training policy the company applies and the fastest available on market equipment that the company purchases, we achieve our clients’ needs. 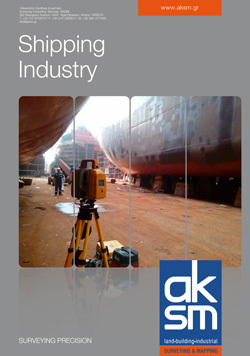 • As-built documentation: 3D laser scanning solutions ensure that ship hulls and components can be digitized when original drawings are missing or inaccurate (as it is often the case with old vessels). • BWT Retrofit: upcoming legislation requires the installation of Ballast Water Treatment systems on board all ocean-going vessels. 3D laser scanning can overcome challenges such as measuring the limited space in engine rooms, and capturing reliable data for the retrofitting installation process. • Ship repair: providing a fast and accurate way to inspect ship parts during repair.